Kneeling is a very humbling posture. The very act of kneeling before someone is to put yourself in a vulnerable position recognizing the other person’s authority, or when we kneel before God, it is that we are acknowledging his holiness and greatness. In the Catholic Church we believe that the bread and wine are transformed into the true body and blood of Jesus Christ although remaining under the appearance, taste, and texture of bread and wine. The process is called transubstantiation and what happens is a miracle of faith given to us by Jesus and passed down through his disciples. After we receive the body of Christ and his precious blood we return to our pew and kneel for a period of time. We kneel for one primary reason: it is a sign of respect for the real presence of Jesus Christ. We are to kneel until the Eucharist is stored safely in the tabernacle. The General Instruction of the Roman Missal (GIRM), which is the main document that prescribes how a Mass is to be conducted, makes very clear that we are to kneel after receiving the body and blood of Jesus Christ in the eucharist. When I go to Mass I occasionally see some people kneel for a short time and then sit down on the pew. While the GIRM does make exceptions for people with certain physical conditions, those who are physically able to kneel should. We don’t kneel because of the priest and we don’t kneel until we are done praying even though the distribution of communion continues, we kneel when the blessed sacrament is out of the tabernacle, is being distributed to the faithful, and we may return to a sitting position once the blessed sacrament is no longer out, when the tabernacle door has been closed, signaling the end of the communion rite. Kneeling until the priest sits down is not necessary, but is permissible. After communion there is often a silence (sometimes very short) and the GIRM says that “the faithful […] may sit or kneel during the period of sacred silence after Communion.” (GIRM 43). Otherwise, kneeling has taken place from the Agnus Dei (Lamb of God) up until this point. The diocesan bishop has the authority to decide if something other than kneeling will take place during the Mass. In most dioceses, kneeling during communion is the norm. I am catholic i was baptised when i ws ababy .Do i stil need to baptised 4 me 2 receive? If you went through religious training during childhood and have already had your First Communion, you may partake in Communion AFTER you have been to Confession (you should not take Communion if you have any mortal sins that you have not confessed). You will need to go through RCIA if you have never taken Communion before. Talk to your priest to see when classes start and to clarify your situation. I am a Catholic and I know that what we have gone throughout the years for the three years, that is Year A, Year B and Year C are properly set for us.Can my beloved brothers and sisters in Christ to truly understand why we have Year A, Year B and Year C and what reading do we have for Year A, Year B and Year C or are the readings the same throughout the three years. 8) IS PURGATORY REAL ? YES!. WHAT DOES THE BIBLE SAY ABOUT IT? 12)WHY DO WE ASK THE SAINTS TO PRAY FOR US? 13) WHY DO WE USE MEDALS, CRUCIFIXES AND SCAPULARS AND BONE OF SAINTS? I’ll keep you in prayer. This shouldn’t be happening in any parish. Why do some parishes not enforce adoration? Isn’t something all churches should do? Our priest says we should all remain standing until everyone receives communion!!! I don’t understand the unity in this!! He says if we kneel after receiving communion, we are disrupting the unity and not being unified with the rest of the congregation. In his homily, today, he talked about being ready for the coming of Christ. He asked, “Will we take a bullet for not denying our faith as Christians?” What do we do when we are told not to kneel after receiving the true body of Christ? Shouldn’t every kneel be bending at His presence? Shouldn’t we be allowed to worship in our own Churches after receiving Christ as we would like? Why, when there are so many terrible things going on in the world right now, should a priest be hard on someone if they prefer to kneel after receiving communion? This is how I respect and show some small gesture of adoration to our Lord. It would be nice if we had adoration in our church but we don’t!!! It would be nice if we had a short time of quietness to reflect after we go back to our pews, but if we all remain standing until everyone is done, he quickly jumps right into the closing of the Mass. I’m sorry, but I truly don’t understand the humbleness in standing before the Lord!! We had that in our church and I didn’t like it , kneeling was my time with the Lord, but now we are back to kneeling again. Can you tell me exactly which paragraph(s) you are referring to? I don’t see it clearly stated anywhere. 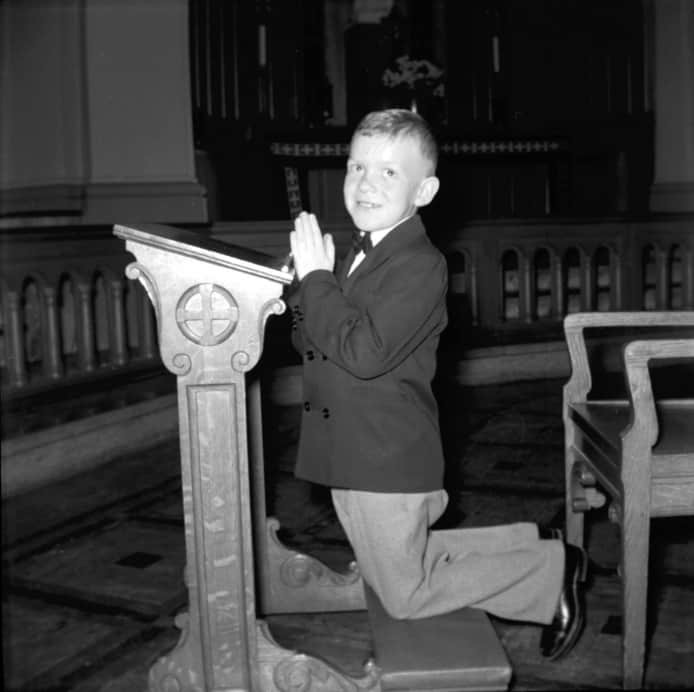 Kneeling posture after communion, while recommended by the GIRM, is actually up to the diocese, and the magisterial authority of the local Bishop. Some diocesan instructions are to stand after communion, and to continue to stand until all have approached the Eucharist and returned to their seats. The intent is to recognize the unity of the congregation’s prayer and Grace, and the shared participation of the Body of Christ (“Church / Community”) in the Body of Christ (“Eucharist”) — rather than limiting it to internal reflection and communion while kneeling. I am Maronite Catholic and we do not kneel at Mass, even after Communion. Our churches do not have kneeling benches. Kneeling is reserved for penance. FYI: The Maronites are Eastern Rite Catholics and fully in communion with the Catholic Church. Francis is our Pope as head of the Universal Catholic Church. I’m a practicing Latin/Roman rite Catholic and we do not kneel in my parish at all before or after communion. In fact our priest invites those who want to, to stand around the alter during the Eucharist portion of mass. This is actually how the early church worshiped. I personally cannot stand kneeling as it symbolizes individualism, conservatism and inferiority to the priest as opposed to all standing united in Christ. I also find kneeling extremely ironic, when not a minute prior the priest says to the congregation to ‘Lift Up Your Hearts’. How can you possibly do so while kneeling? Anyone who thinks kneeling is the only ‘way’, clearly hasn’t been to a catholic church without either a) pews, b) pews without kneelers and/or c) knows nothing about the Eastern Catholic rites. I’m with Maronite Jim. in that kneeling is reserved for certain times throughout the liturgical year (penance, Good Friday, etc.). Thank you so much dear brother for this wonderful teaching, I never hear anything like this since I became a catholic though I was born catholic, I still have a question to ask ; recently in my country Nigeria, the congregation of bishops agreed that distribution of holy communion should be on hand no more in mouth, but some people refused to buy the idea saying that its wrong for them to touch the body and blood of Christ, I am confused on whom to follow; please advice me on the right part. It is not merely that you are touching the body of Christ. It is also to reassure the ministers and/or priests that you have the right intention for the body and blood of Christ when you have it placed on your tongue. It is also no longer appropriate to dip the body into the blood of Christ, which used to be a norm. I am a Eucharistic minister only, but I have learned a little bit on this subject. For these reasons, it is probably better that you have it placed on your tongue. Alaeze — The bishops have the authority in matters of liturgy, and the faithful should obey them. It is not inherently wrong to touch the Body of Christ. After all, even when one receives on the tongue, one is touching the Body of Christ. I am a Legionary in St. Agnes Catholic Church, Maryland, Lagos in Nigeria. This will barely 10 months since I joined. And as you may be aware, evangelism is one of our core duties but often times I go out on visitations and evangelism, I’m often bombarded with questions about the catholic faith and why we do what we do and this is the reason I’m searching for answers as I do not know much. I read the article on Kneeling after Communion and agree The Lord is with us. Our church but in the bulletin and made annoucements that we are to stand until everyone recievies Communion! I am very upset many people do not kneel they just sit and the Priest tells people to sit before the chalice is put away. They say this is what the 2nd Vatican said to do. I am very confused why are they taking away all the respect and Love out of church?? I feel very confused and empty Communion is my time with Jesus not the people in the church? I recommend you contact your nearest parish or priest.